Twenty-five years later, I wonder how much of his list I’ve covered, and how much it’s changed. If I were to meet him and tell him about my life, would he feel that my life is on track, or would he only see gaps in experience? What about things I’ve done that he has not? Would he find them threatening? Would he dismiss them as distractions? I’m aware, both in the Zen community and in myself, of our tendency to define what is real and what is not according our own experiences. It’s natural. Anyone who has kids (this is especially true of new parents) probably has the experience of talking to a childless friend and thinking, “This guy doesn’t know anything about the real world. He has no idea.” And many young people have the opposite experience — talking to a friend whose life revolves around her children and thinking, “Wow, she’s completely lost in her narrow little world.” When we are among the initiated, we imagine that it couldn’t possibly be any other way; when we are outsiders, we mock the people on the inside for their self-importance. So it’s natural that in the Zen community, we tend to advocate a kind of training similar to what we ourselves have experienced. There are only a few Zen teachers in the US who are products of a traditional monastic system, and as a result, there are only a few who feel strongly about passing that system on. There are some on the extreme other side who feel monastic practice is a complete waste of time, then a majority in the middle who feel that it’s OK for people who are into that sort of thing, or who feel it might have value in small, manageable chunks. But, at least for the moment, there is very little energy behind establishing monastic training opportunities for the current and future generations of Soto Zen priests. That’s how I see it, based on conversations with other priests, attendance at national meetings, and perusal of what’s written on various Zen center websites. A few teachers may still hold up “the monastery” as a kind of abstract, romantic ideal, but much more often, the language we hear is “outside the monastery,” or “beyond the monastery” (if the monastery is mentioned at all). Many, many teachers reference the monastery not as an ideal, but as something that is fundamentally at odds with modern living. It’s the problem with Zen. And when I read such statements, I always wonder, “Who is the audience here?” If American Zen teachers are already not actively advocating monastic training, then against whom are we arguing? At this moment in the history of Zen, abandoning monastic practice is hardly a revolutionary move. I think there are legitimate and constructive conversations to be had about this: What is monastic training? What’s it about? If there is a goal, what is it? What does it produce? How has it justified its existence up to now, and do those justifications hold up in a modern, Western context? If yes, then what causes our cultural resistance to such practice? And if not, why not? What aspects of the monastic tradition in Japan can find traction in the US? Which require modification? Which don’t stand a chance from the start? And how do we determine such things? If we attempt to establish an “American” monastic model, what is our inspiration? Modern Japanese monasteries? The monastic guidelines (shingi) left behind by Dogen? By Keizan? Do we go back further, to the shingi from China? Do we go back to the beginning, to the birth of the monastic sangha in Buddha’s time and take our cues from that original structure? American culture hates rules, but it also has a deep puritanical streak that connects to the tradition of the vinaya (browse almost any Buddhist blog’s comments section to find people insisting that any monk who is not celibate and poor is a scam artist, a sexual-predator-to-be who’s just in it for the money). How can we fund monasteries in the US, knowing that the Asian models of patronage just won’t work? At the center of all of it: What is a priest? These are really interesting questions. These are among the most compelling questions I’ve ever encountered. But before we can address any of them, we need to move beyond the popular idea that the monastery is somehow different from the “real world.” This idea is everywhere. I hear over and over again that we don’t need monastics, because monastics can’t possibly understand the challenges of ordinary people. People refer to monastic life as something sheltered, a way of hiding from “real life.” They say, “Get a job.” This could only make sense to someone who is looking at monasteries from the outside. One night in the monastery, I slept in a closet to hide from a monk who had gone down to the local village, gotten drunk, and decided upon his return that this was his night to kill me and the monk in charge. I just stayed where he couldn’t find me, and the next day we found our mutual ways back into the normal routine. I watched a monk trying to break a sleeping monk’s face with a kyosaku (but missed, luckily – it was dark). One evening after dinner, after hearing the next day’s job assignments, a monk who felt he spent too much time in the kitchen jumped completely over a table and tried to strangle the shuso (chief novice). I watched a fistfight break out over how much or how little monks should be involved in politics. A monk went crazy one day and basically destroyed a room, like a wild animal trapped indoors. We all waited in the hallway for it to end, then went in and silently cleaned it up. For a time, the head monk, hell-bent on saving money, tried to force us to eat rotten pickles every day – so rotten that they had turned from yellow to a deep blue. One afternoon, I just went into the woods, dug a hole, and buried them. In winter, when the head monk had to suddenly leave for medical reasons, some of the junior monks holed up in a room for three weeks. They were free, and their version of embracing freedom was to close the door and keep their little kerosene stove burning constantly, with the windows closed, essentially gassing themselves into a constant toxic sleep. They’d stumble out from time to time, looking intoxicated and confused, then wobble down the hall to raid the kitchen. During that whole period, I don’t think I ever heard any of them actually speak. A monastery is not some romantic place where people spend their days serving each other tea and thinking about saving all beings. When we look beyond the schedule of ceremonies and zazen, what we find in monasteries is an experiment in intimacy. It’s an intimacy with others — more than once, I’ve heard it likened to a pot full of potatoes, rubbing against each other until they’re all skinned and shiny white. It’s also an intimacy with yourself. If you sit six hours of zazen a day, every once in a while, zazen will slip away and you’ll find yourself thinking about things — a recurring theme, guaranteed, will be, “What the hell am I doing here?” You have time in a monastery to go over every mistake you’ve ever made, to dissect every regret, to luxuriate in self-doubt. More than anything, it’s an experiment in saying yes. We say yes to the bell, to the schedule, to the demands of being, in many ways, glorified custodians (if you go to bed at 9pm and wake up at 3am, that’s not just an 18-hour day, it’s 16-18 hours of actually working). We say yes to seniors, putting personal issues aside. We say yes to the tradition, to the 24-hour ritual enactment of the life of Buddha, eating this way, standing this way, sleeping this way, sitting this way. And under all of it is the fundamental yes, the one where we decide not to leave, to stay where we are. We agree to move in concert with these crazy people. In this way, we start to understand what it is to move beyond preferences. 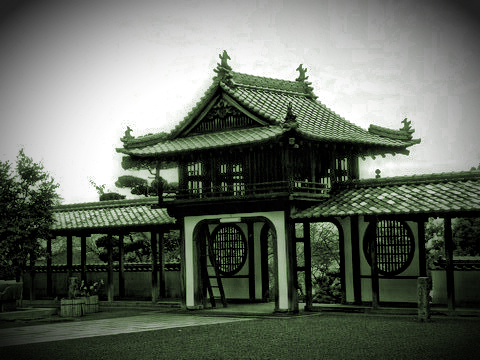 A mantra in the monastery is suki kirai kankei nai (好き嫌い関係ない) — essentially, like and dislike are irrelevant. If you’re like me, then in the beginning, you hear this to mean, “Don’t whine.” But it’s much more than that. It’s at the center. When my daughter just bumped her head and my son is tantrum-screaming as if he’s on fire, but it’s something about which cup I gave him, I have lots of preferences about how I would like things to be. And none of them matter. When we default to the idea that the monastery is another world, we both demonize and romanticize it — we insist that its differences make it irrelevant, and in doing so, we imply that it really is a magical world where bodhisattvas stroll around, unencumbered by human problems. The most basic stance of Buddhism, from its first day, is that human experience is universal — we all see the world through the lens of our own narrative, and in doing so, we all create criteria by which we judge (and thereby distance ourselves from) this moment. We all separate the world before us into “like” and “dislike.” We all believe, consciously or unconsciously, that some things are more “real” than others. We all, I suspect, have a hierarchy of experience. And if pressed, I’d bet that most of us believe, deep down, that there is some place a person can go to “get away from it all,” a place for retreat. There is no such place. There is only this place. In a monastery, too, there is only this place. When this is all there is, how can this be unreal? When this is all there is, how can there be someplace else to go? This entry was posted in Uncategorized and tagged monastery, shingi. Thank you for sharing your experiences with us. If you ever come close to Europe, please let me know and I’ll buy you a “hisashiburi desu ne” cup of coffee. Thank you for this post. It’s helpful for me to know that people are people everywhere, even in the monastery. Basically crazy. If my life continues as it has, I may never even get a chance to visit a Zen monastery. Your post is comforting for me though because, maybe my life as it is will really offer enough Dharma for one lifetime. So, I’ll let the people interested continue the debate around monastic and lay practice. From where I’m at, I don’t feel I can offer much to compare and contrast on the subject. So, please let me know when we get it all figured out. you raise interesting questions with no easy answers, which of course are usually the most interesting. So easy for thinking to fragment itself, which is what it does best for better and worse, and to believe that the fragment it holds is the whole thing. I like the way you begin to highlight the strengths and weaknesses of different forms of practice, lay and monastic. Put human beings together and it gets messy whatever the context! I do wonder about the darker side of saying “yes” particularly in the Japanese Zen tradition and that has had some very unfortunate outcomes playing into certain aspects of Japanese culture/history. Sometimes “no” is most wise and compassionate, and not just regarding Mu! I guess it’s always caveat emptor for any position, including the so-called no-position. As one of my psychotherapy teachers once so wisely said “don’t ever know too soon!” I do very much appreciate the thoughtfulness that comes across in your posts so far. I love your deconstruction of the romantic take on monasticism. Yes, wherever you go (are), there you are. In the midst of likes and dislikes. Always trying to escape to some idea of how I would prefer this moment/life/experience to be. Iam interested in hearing more about how we go beyond preferences when they occur, as they do a million times a day. The Ordinary Mind approach of Joko Beck is to label thoughts and feel sensations so that we become aware of ongoing preferences (what they are and how they impact us) as they occur in moment-to-moment experience. Thank you for your thoughtful comments and persistently intriguing questions. As someone living and practicing in Seattle, having the ability to practice both in lay and monastic settings (Everyday Zen as well as Great Vow Monastery in Oregon), these continue resonate and ramify in my own Dharma journey. Helen Tworkov’s 1990 book presents strident criticisms regarding the lack of monastic practice in Western and US Zen, and while over twenty years old, her points only continue ramifying. While my sense is that both householders and monks are necessary for a tradition to flourish and evolve, with true depth and sense of 4 truths and 8-fold path, it remains to be seen how viable the monastic aspect is in this capitalist and materialist culture. Again, thank you for your comments and questions. I very much look forward to reading more. Thank you for directing me to Helen Tworkov’s book — I haven’t read it, but now I want to. I find that my enthusiasm for the monastic tradition, when confronted with my skepticism about its viability in a culture that has little chance of embracing it, can sometimes morph into something like a preemptive disappointment, or cynicism. It does me good to be reminded of places like Great Vow, where the experiment is kept alive. I was shrieking with laughter all by myself here in my quarters as I read about the skirmishes of daily training temple life. That is completely my experience — there’s as much human craziness in training temples as there is in offices, schools, families or any other collection of people. From shouting matches to people disappearing for days — yup, that’s daily life. Folks who think a Japanese training temple is all about endless days of peaceful mountaintop zazen get a big surprise when they arrive and find it’s infested with actual humans.